A Los Angeles production company has bought the rights to a biography of Barcelona star,Lionel Messi.The football legend's life will be made into a movie. The film is set to focus on Messi’s boyhood in Argentina and treatment for growth hormone deficiency, before depicting his on-field successes. The film will be based on Luca Caioli’s book ‘Messi’, which features interviews with the player’s former coaches, family and team-mates, as well as the man himself. Epic Pictures Group hopes to finish the film in time for the 2014 World Cup. 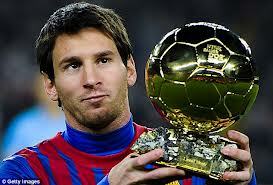 Lionel Messi, 25, has won the Ballon d’Or, awarded to the world’s best player, for the last four years.